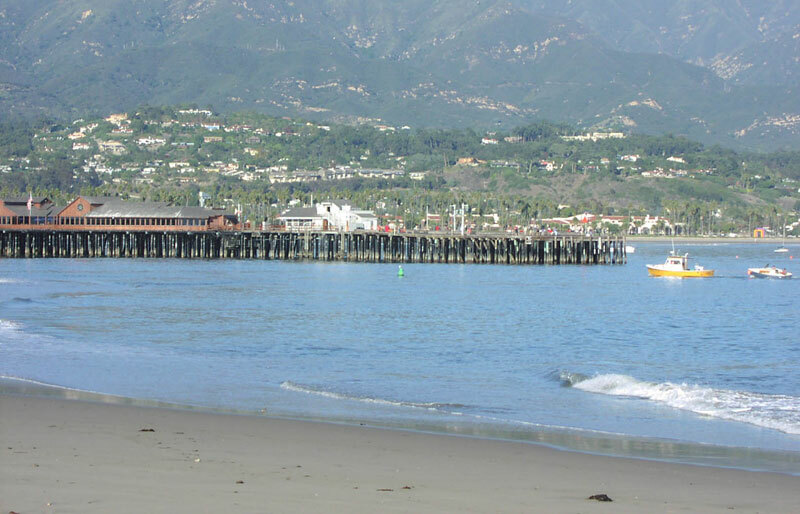 What Caused Santa Barbara Mooring Problems? SANTA BARBARA — The use of a new environmentally friendly mooring system at Santa Barbara’s East Beach mooring field off Stearns Wharf has been discontinued; however, the manufacturer claims the moorings work fine — it’s the connecting components the company does not manufacture and the conditions where the moorings have been installed that have led to problems. The field is composed of 45 single-point swing moorings, 12 of which were Seaflex, or dynamic mooring configurations that some boaters said have not held up to the standards associated with the product. These moorings utilize stretching line that has been compared to giant rubber bands, intended to ebb and stretch more fluidly with tidal flows than traditional chain-to-nylon rode catenary systems. At Santa Barbara’s Jan. 19 Harbor Commission meeting, it was revealed that nine out of 12 moorings using the dynamic system that included a Helix anchor and Seaflex line had reportedly failed, leaving some boat owners with an unusable mooring and a bill to fix the problem. Accusations and finger-pointing have been going on throughout the process, but no clear-cut answers have been determined as to what portion of the system was at fault — or whether the city, the product, the installer or the mooring owners themselves were to blame for the multiple failures. The mooring field was introduced for public use in 2006 by the Santa Barbara Harbor Department. It allows for catenary mooring systems (standard chain and clump anchor), and the Seaflex system (dynamic mooring system) was also allowed shortly after the mooring field opened, promoted as a more space-efficient and environmentally friendly mooring option for the open-ocean field. The Harbor Department required each boat owner using the mooring field to decide what type of mooring to install, and then purchase their own mooring and equipment — and they were required to use city-approved inspectors and installers. Also, the amount of rode needed in the Seaflex configuration is less than a standard mooring, due to the line’s ability to stretch and ebb with the tides. The moorings’ smaller 3-to-1 scope instead of the standard 5-to-1 meant more boats could be placed closer together in the field. Kronman contacted Huntington Beach-based U.S. Mooring Systems Inc. to install the dynamic mooring systems in Santa Barbara’s field, and the company was placed on a five-year agreement, giving boat owners a city-approved installer for the Seaflex/Helix mooring system. “Since they specialized in installing this type of mooring, and since there was interest in these mooring configurations, we added them to the list of approved mooring installers,” Kronman said. U.S. Mooring Systems Inc. installer Michael Rawlings, who has installed more than 100 Seaflex/Helix-style moorings on the West Coast, said he hasn’t seen anything like what’s occurring in Santa Barbara in other Seaflex mooring installations. “We have 80 moorings in Lake Tahoe that have experienced zero problems,” Rawlings said. The company also installed 10 moorings off Long Beach’s Belmont Veterans Memorial Pier five years ago and maintained the system for a year with no problems. Rawlings said the mooring field owner has not contacted them since then, and he is unaware of any problems at that field. According to Rawlings, problems arose in the system about one year after the original installation in Santa Barbara, but he said that most were small issues involved with line chafing. “The problems we were seeing early on were normal occurrences for all mooring types,” Rawlings said. However, he said that despite the mandatory twice-a-year inspections his company completed on the moorings, mooring owners were not regularly maintaining their moorings and expected a maintenance-free mooring. In an effort to minimize further maintenance, Rawlings retrofitted the moorings in 2008 to include fewer metal components at the top, where the Seaflex line connected to the buoy. But mooring failures persisted, he said. As failures in the dynamic mooring configurations mounted, U.S. Mooring System dropped out of the mooring field program in September 2010, reporting that it was not financially viable for the company to continue in Santa Barbara as a mooring inspector. After Rawlings backed out of the agreement, the remaining mooring owners in the field were left without a city-approved Seaflex/Helix vendor for their moorings, and some said they felt they were out of options for the Seaflex systems. In January 2011, mooring owner Nicole Aversa’s 28-foot daysailer La Nina broke free from its dynamic mooring system and was later found a mile offshore before being towed to a slip in Santa Barbara Harbor. While Rawlings had continued to provide some follow-up maintenance to mooring owners in the East Beach field after issuing his discontinuance notice, Aversa’s mooring was not inspected until August 2011, when the Harbor Department announced Diving Support Services (DSS) as the new approved vendor with Seaflex capabilities. DSS located Aversa’s Seaflex mooring intact, but on the ocean floor. The company quoted more than $2,000 in costs to recover and repair the mooring, which Aversa would have to pay, on top of her berthing costs while her boat was not tied to a mooring. Aversa is one of nine mooring owners who said they have experienced failures in their mooring systems and is not the only one who has said that the Harbor Department and inspectors have been less than responsive. Eric Schwartz, who said he experienced a dynamic mooring failure, reported that he had trouble getting a response from the Harbor Department when he requested the contact information for fellow Santa Barbara mooring owners who had experienced similar problems with U.S. Mooring Systems. The issue was brought before the Harbor Commission, and commissioners told the department to make the information available as soon as possible. Kronman said the contact information has been released to Schwartz. He added that, over the years, the department has received several complaints from mooring owners regarding U.S. Mooring Systems’ responses to inspection requests. “We got calls that U.S. Mooring Systems was unresponsive to their perceived failures in their installations, but we did not receive any complaints about their inspections: That wasn’t the issue,” Kronman said. In looking for causes for the multiple failures, Kronman said there are a variety of issues to consider: the mooring components themselves, the installation style, the expected maintenance by permitees, the unknown variables of the offshore site and the unpredictable behavior of people who traverse the mooring area. All could all have an effect on moorings, he explained. Currently, two fully functional Seaflex configured moorings remain in Santa Barbara’s mooring field. At the Harbor Commission meeting, Kronman said that the 14 Helix anchors in the field will remain in place, and they can be used for future mooring owners, but only to attach chain mooring systems. In an interview with Seaflex president Lars Brandt and Seaflex U.S. marketing manager Brian Hylland, the two stipulated that the issues in Santa Barbara involved a kind of “loss in translation” between how a Seaflex mooring is installed in the United States compared to its original European configuration. The company was started by Brandt’s father more than 30 years ago, and has been installed in both dock and mooring configurations around the world. In Europe, the Seaflex system attaches to a salmon-colored float through a thimble that is spliced together as part of the Seaflex line. No metal components are required for the system except for the shackle connections between the Helix anchor and the line near the ocean floor. The buoy system utilized in the United States has an added metal attachment that must attach the buoy to the line, which allows for another metal attachment to corrode, or could be causing added chafing to the line. “That is a big difference between the American and European styles — and the installers in this case used a standard U.S. buoy, and the necessary shackles, thimbles and pendant,” Hylland said. “Those are the things that always corrode over time, no matter if you use Seaflex, rope, chain or cable, if you do not maintain and change them out. Seaflex certifies companies that wish to install the mooring systems as part of their work offering. Companies that wish to receive Seaflex installation qualification must take a course where they are shown the way to properly install Seaflex-style moorings. U.S. Mooring Systems had been a certified Seaflex representative for years prior to the Santa Barbara moorings; however, like all mooring installers, they were required to adhere to specific mooring regulations in each area where moorings are installed. In addition to the U.S. regulations, the conditions in the East Beach mooring field have raised concerns. Lobster fishing activity has been prevalent in the area for years, and constant activity around mooring lines could have been one major cause of failure. “I can’t tell you whether that’s an issue, but if this is an area prone to catching things on moorings, Seaflex is not going to work there,” Hylland said. Regarding the city’s decision to discontinue the installation of Seaflex mooring lines in the field, Hylland said he didn’t feel the need to argue against it. “Until we figure out what exactly the issue is, they probably shouldn’t be installed there,” Hylland said. Looking forward, Seaflex has been working on new alternatives to the problem associated with the metallic buoy connection, and the company has plans to unveil its European-style float that will conform to the United States’ white and blue-striped color scheme, while eliminating the need for corrosive hardware at that connection point. In addition, Brandt said the company is working on new titanium-based hardware that will be more resistant to corrosion than marine-grade stainless steel.